Dragons - 1st Inning: Tim Kim singles. Stan Spancer singles. Erik Melara reaches base due to a fielding error; with a run scoring on the play. Joel Iniquez hits an RBI single; scoring 2. Dragons get 3 runs on 3 hits; with one Tribe error and they leave 2 men on. Tribe - 5th inning: Bret Urie doubles. Eric Dillon reaches base on an error; with a run scoring on the play. Tribe get 1 run on 1 hit; with 1 Dragon error and they leave 1. Dragons - 6th Inning: Tim Kim leads off with an infield single. Stan Spancer sacrifices; moving Kim to 2nd. Jose Iniquez is hit by a pitch. JC Barker singles home Kim. Dragons get 1 run on 2 hits; with no errors and they leave 2. Tribe - 6th Inning: Tully Rankin leads off with a single. Kevin Armendariz hits an RBI triple. Stephen Ohayon reaches base on an error; with a run scoring on the play. Ryan Davis singles. Tribe get 2 runs on 3 hits; with 1 Dragon error and they leave 1 on base. A special mention ... you will hardly ever see better combined pitching stats in a game than was the case in this one. Congratulations to Jose Iniquez of the Dragons AND Jesse Martin of the Tribe for two solid (and extremely similar) pitching performances! Dragons pull out a thriller; winning the title by a final score of 4-3. 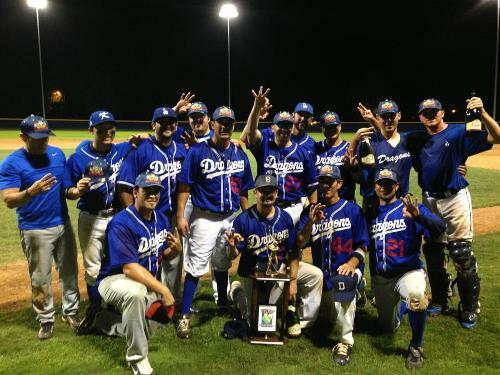 Congratulations to the 2013 Wood Bat Champion Dragons!